If you're looking to ride the Javelin train, it'll be essential to get a good understanding of Southeastern Rail's timetables for the service. Always check you're using the latest timetable for the routes, as they may change at different times of the year. Delays due to inclement weather are not seen so often on the high speed services as they can be on other UK rail tracks, but delays can still occur of course. Visit the dedicated page if you need a Javelin route map. Southeastern operate around 170 high-speed services each day in a mixture of off-peak and peak time services. Two trains each hour run into London via Gravesend and Ebbsfleet, one travels from Dover via Ashford, and a further service runs from Ramsgate via the stations at Canterbury West and Ashford. Essentially this gives commuters four Javelin services into London each hour. Trains originating at Dover and Ramsgate split and join at Ashford to deliver a once every 30 minutes service. Extensions to the services will take Dover train travelers on to Deal. 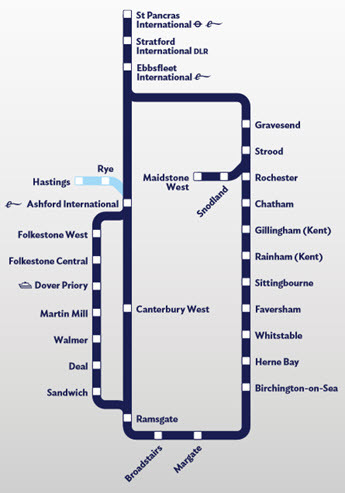 Likewise an extension for Faversham takes you on to Ramsgate via Herne Bay and Whitstable. There's a potentially useful St Pancras to Ebbsfleet shuttle which runs solely on the high speed line. For the latest train timings and news of any delays, it's best to check out Southeastern's published Javelin timetable which currently covers from 21 May to 30 December 2017. Scroll down and select option 8 when you hit the page. Note there's a special timetable for the weekend of the August bank holiday.